and management solution, we’ve been busy streamlining our traditional power products business. Power-One is one of the few remaining companies with the product breadth to support every step in the refinement of utility needed to power high-availability infrastructure systems at the site, system and semiconductor levels. Power-One is a leading provider of power conversion and management solutions. Our design and manufacturing teams are at the forefront of alternative and renewable energy inverters and energy-efficient power conversion products supporting the server, storage, network and telecom equipment sectors. 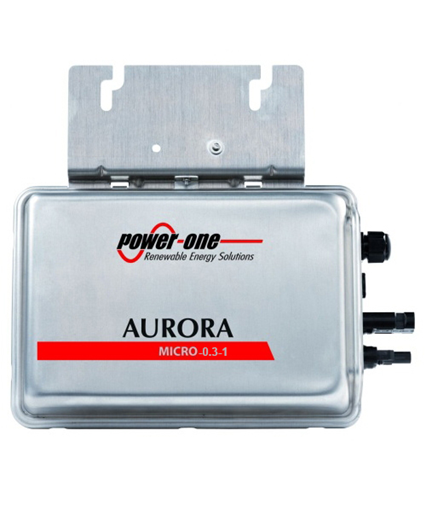 The new Aurora 300-watt micro-inverter product is designed for use with large 72 cell panels. The ability to individually link all modules within a specific installation is an alternative to the traditional Aurora string inverters Power-One is famous for.Micro-inverters have some advantages over string inverters. They allow you to control the panels output individually and offer Maximum Power Point Tracking (MPPT) for each single module. They also allow you to control individual panels in different ways and reduce the losses in efficiency in a variety of challenging conditions.